View of the Suspension Bridge from Marlow Lock and All Saints Church. 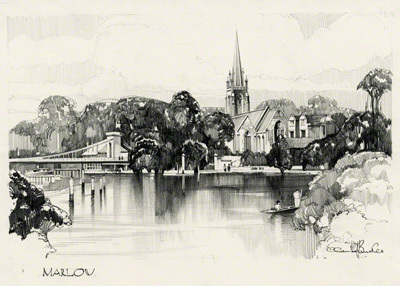 This pencil sketch by Claude Buckle is almost identical to the carriage print made later in 1954. This time the bridge is in view with the church shown in the background. 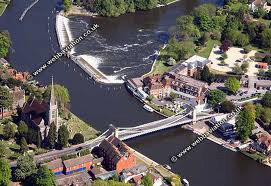 Marlow Suspension Bridge is a road traffic and foot bridge over the River Thames in England between the town of Marlow, Buckinghamshire and the village of Bisham in Berkshire. It crosses the Thames just upstream of Marlow Lock, on the reach to Temple Lock. The bridge was built in 1829 and is a smaller version of the The Széchenyi Chain Bridge, spanning the River Danube in Budapest. Both bridges were designed by William Tierney Clark. Created in 1935.